In a rain simulator rainfall with rain intensities of 40-300mm/hr was showered onto a 4m diameter bell-shaped radome. This is to measure water film attenuation and a water film thickness for two types of radome surfaces: a surface with HIREC coating and that without. A receiver was put inside the radome, and a transmitter outside. 9.8 GHz radio wave was aimed from the transmitter to the receiver. The distance between the horns of transmitter and receiver was 5m. The thicknesses of the water film, formed on the radome surface and at the height of +-20 cm of the receiver, was measured by a film meter. Rain water runs into drops at the surface, flicking and falling out the surface. No water film was formed. Rain water wets the surface and water waves run down the surface. Radome surface was covered by a water film. Radio attenuation was extremely rare compared to that of no water repellent coating. Effect of extremely low rate of radio wave attenuation during rain fall. Radio wave rapidly attenuated at 40 mm/h rain intensity, and its attenuation increases with the rain intensity, which is caused by the water film attenuation. In gusty rain, the radio attenuation becomes 10 dB one way, which means 20 dB attenuation in both ways. 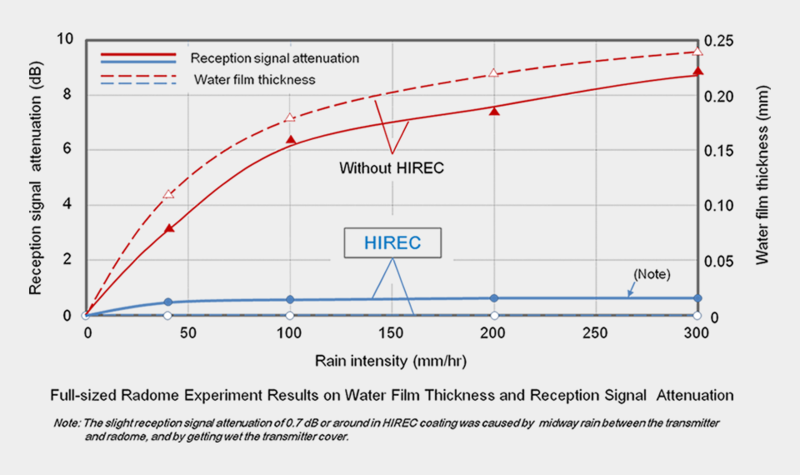 HIREC coating drastically reduces water film attenuation in rainfall.